I recently wrote a 15-page getting started guide for the $5 ESP8266 WiFi modules for Kiwicon 8, a local New Zealand hacker con. It’s available as both HTML and a PDF. 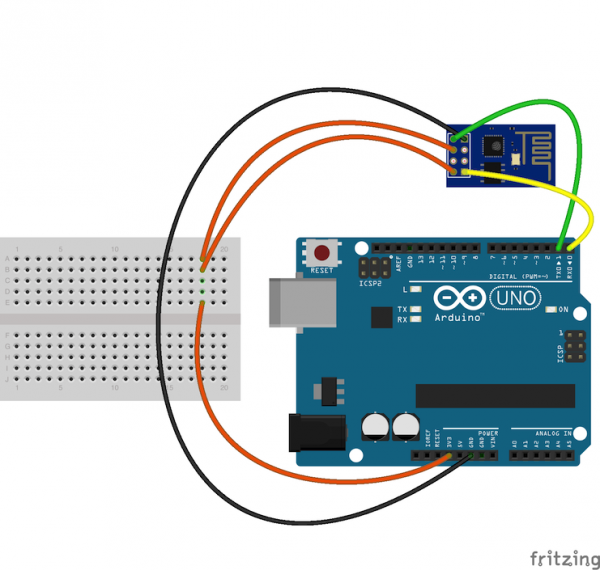 It provides details on: how to make the hardware connections using an FTDI Board or Arduino (with suitable disclaimer); how to communicate with the module; using AT commands to act as a client, server or AP; and, updating the firmware. The con brought in a shipment of 100 of the modules which sold out extremely quickly and the guide provides a one-stop-shop for how to get started with the modules. This entry was posted on Monday, February 16th, 2015 at 8:58 pm	and is filed under documentation, how-to, wireless. You can follow any responses to this entry through the RSS 2.0 feed. You can skip to the end and leave a response. Pinging is currently not allowed. If this is the case (and to clarify – I don’t have one of these modules – yet): Then I think a reliable tutorial should include a known good baseline firmware image to upload to the module before claiming the rest of the tutorial works. I am a little bit stuck and I could REALLY use some help. So my friend and I are trying to send data through a server to a database (ESP8266 + Arduino, Apache Server and Mysql Database). When we send data, it says “send ok” and after that it says connection timeout. On apache it says 408 error. A few times we got 200 4961 (this is what we want) but that only happens when we send GET /HTTP/1.1 and when we send to GET/index.php?img=pngPlugIn HTTP/1.1. We try to send GET /pm/add_message.php?pmu=RAL005-07001-FL02-0030-2L Host:192.168……. but we get 408 320. Any suggestions? Do you know what we might be doing wrong?